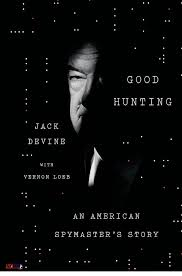 Veteran journalist and author Joseph C. Goulden offers a good review of Jack Devine's Good Hunting: An American Spymaster's Story for the Washington Times. When an expert such as Jack Devine, a three-decades-plus veteran of the CIA Clandestine Service, warns about myriad world troubles stretching into the foreseeable future, serious citizens should take heed — and those now running the agency, both in-house and as elected officials, should give “Good Hunting” a careful read in light of what can be done to protect the country. The capstone of Mr. Devine's career was overseeing the largest CIA covert operation ever, to run the Soviet military out of Afghanistan, a venture inaccurately termed “Charlie Wilson’s War” by the media. Although he and other agency officials praise the now-deceased Texas congressman’s tenacity in obtaining money and arms for the war, Mr. Devine’s colleague Milton Bearden is quoted as quipping, that it was “‘Charlie Wilson’s War’ only in Charlie Wilson’s mind.” In any event, the operation drove the Red Army out of Afghanistan.